My little waterfall of color - 407 yards of 2-ply, handspun goodness - a personal best for number of yards spun in a single skein. This is the Columbia/mohair roving I bought at last year's Fair. I've slowly been working my way through the 1+ pound bag. At Thursday's spin night, I plied 2 of the 3 bobbins I've had sitting around for awhile. I love the colors and the yarn is well balanced; I was very pleased with how it turned out. I was going to make a scarf with this, but I think I'll wait until it's all spun and see how much yardage I have. Maybe enough to do a shawl? We'll see . . . I found this wavy scarf pattern on Ravelry and immediately knew I had to make it - AND that I had the perfect yarn already in my stash (3 skeins of Noro Kabuto. 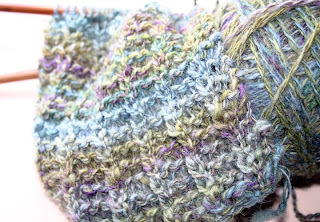 Softer than usual for Noro and a solid color. 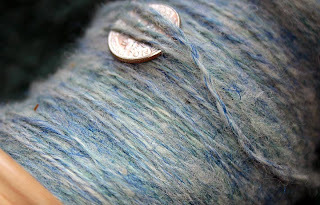 Don't think I've ever seen a mono-color from Noro before.) You'll notice that it's knitted? I'm enjoying every stitch so far. Friday is now 'Knit Day'. When I sit down to work on a project, I automatically reach for crochet. To encourage me to work on other crafts, I've designated Thursday for spinning and Friday for knitting. Weaving Monday may be next. 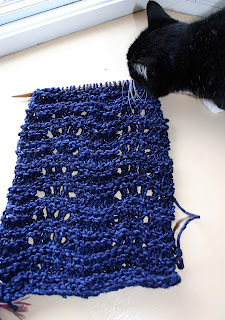 I knit one 66-yard skein last night before moving on to . . . 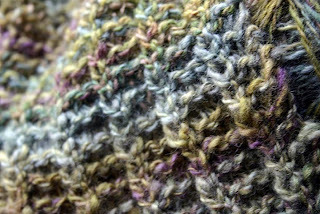 The Yarn Harlot's One Row Handspun Scarf. 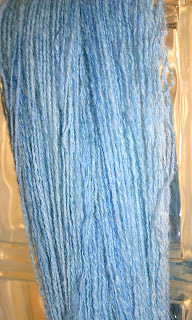 My handspun. My knitting. This is the Iris Eyes Are Smiling roving I spun and entered in last year's Fair (honorable mention! whoohoo!) This is another pattern I knew I wanted to make as soon as I saw it. It's a simple 4-stitch repeat that makes a reversible fabric. 4 stitches. You'd think that would be hard to mess up. You'd be wrong.